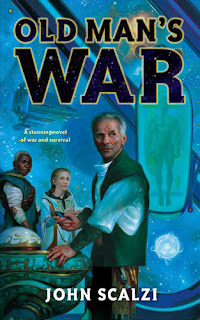 The bits I'd heard about Scalzi's Hugo nominated first novel suggested that it was your standard military scifi, with a twist: In this society, it's the elderly who are sent to war, not the young. This is a technically accurate description. In Old Man's War, humans, represented by the Colonial Union, are just one of the numerous species seeking to colonize the far reaches of space. Information from off-Earth is practically nil, and the CU isn't interested in sharing its technology, which is drastically superior to what's available on Earth. The only way to travel the stars is to be a colonist (an option only open to refugees from the parts of the world that were nuked in a somewhat recent war) or to join the Colonial Defense Forces as a senior citizen. Our protagonist, John Perry, does the latter. If you're wondering how a military with a minimum age of seventy-five is able to function, the answer is simple. Recruits' consciousnesses are quickly transferred to a souped-up clone of their younger selves (with a green chlorophyll tint and cat-like eyes, as well as enhanced strength, stamina, etc.). So, a couple chapters in, and the old guys ain't old anymore. They're still old on the inside, of course, though they could just as easily be forty or fifty as seventy-five. The one thing Old Man's War manages to do exceptionally well is walk the line between escapist shoot 'em up fantasy and "war, what is it good for?" The ethical considerations are present throughout, without themselves dominating the narrative. 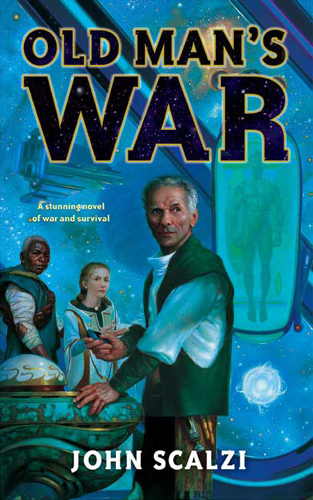 Despite the novel premise, Old Man's War is a solid, but otherwise pretty run of the mill, military sf novel. If you're a fan of that sub-genre, you'll probably like it. If not, I'd recommend Joe Haldeman's The Forever War (1974) instead.